This Class C-8 (Class C-57-22/30-192-S for its driver and cylinder size, and weight on drivers) is a 2-8-0 Consolidation road engine, builder’s #23899. Originally weighing 206,800 lbs. (103.4 tons), 183,100 on its 57″ drivers, it had a 200 lb. boiler pressure and 43,300 lb. tractive effort. A superheater added December 21, 1918 at Sacramento increased these to 216,700 lbs. (108.35 tons), 191,900 on drivers, 210 lbs. pressure, and 45,470 TE. It has 22″ x 30″ cylinders, Stephenson link valve gear, and is 38′ 5 3/16″ long, 10′ 0″ wide, and 15′ 8 3/4″ high. It originally had a “square” tender, replaced in 1940 by a Vanderbilt one weighing 67,600 lbs. (33.8 tons) empty and 174,300 lbs. loaded. Between 1951 and 1955 it received a Vanderbilt 90-C-6 (for water capacity/cylindrical shape) tender, #778, weighing 57,600 lbs. (28.8 tons) empty and 166,100 lbs. loaded, with capacities of 9,000 gallons of water and 3,535 of fuel oil. It’s 34′ 8 3/4″ long, 9′ 10 1/4″ wide, and 12′ 8 1/2″ high. Built for the Southern Pacific for $17,969.01 and numbered SP #2720, it worked SP lines until purchased by the SD&A March 25, 1921 for $37,000 paid in January 1922. 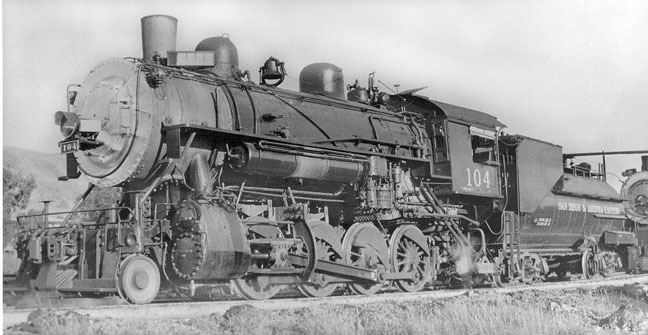 As SDA #104, it was used in freight service and on passenger runs, because it was the “smoothest-riding” SD&A engine. Beyond the San Diego-Campo-El Centro mainline, it pulled SD&A trains on the SP to Niland, Ca (connecting with the LA-New Orleans Sunset) and via Mexicali on the SP and its Ferrocarril Inter-California to Yuma, Az. (connecting with the LA-Chicago Golden State, Californian, & Imperial). In 1923 it was in a promotional film, Carriso Gorge, The Magnificent, and in 1926 in the Goldwyn movie Red Lights, with Marie Prevost and Jean Hersholt, filmed near Hipass. It became SDAE #104 when SP acquired the SD&A in 1933. It was in Los Angeles in December 1937 and February 1940, and was repaired in July 1939 at SP’s Bayshore yards in Brisbane, Ca. SDAE #104 was requisitioned by SP May 21, 1941 on long-term lease, and given back its original SP #2720 number. It served on several SP lines in World War II, (the SD&AE; Imperial Valley; and the Coast Division). It was at San Luis Obispo September 16, 1946 as a Noon Daylight helper, and in March 1948. In September 1948 it was returned to the SD&AE, renumbered SDAE #104, and used on various SP lines. Leased to SP again in 1950 but remaining SDAE #104, it worked at the SP’s Bayshore yards in Brisbane Ca. (south of San Francisco) until retired October 18, 1954. 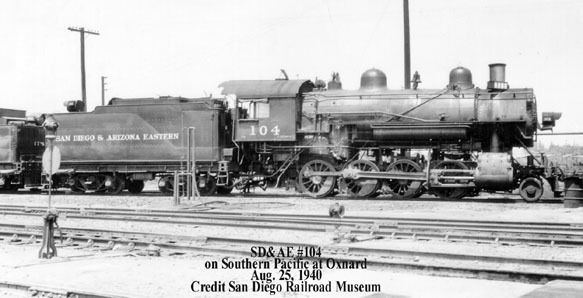 Knowing it was the last remaining steam locomotive that had been owned by a San Diego based railroad, the SP donated it (with ex-SD&AE #050) to the Southern California Exposition/San Diego County Fair @ Del Mar, Ca. through the efforts of the Railway Historical Society of San Diego, which raised $1,600 to move them into the fairgrounds. They arrived on September 2, 1955, were dedicated June 24, 1956, and seen by thousands of visitors for 27 years. The exhibit deteriorated badly in the damp ocean air and on February 22, 1982 the 22nd District Agricultural Association (the fair operator) donated it to the PSRMA. 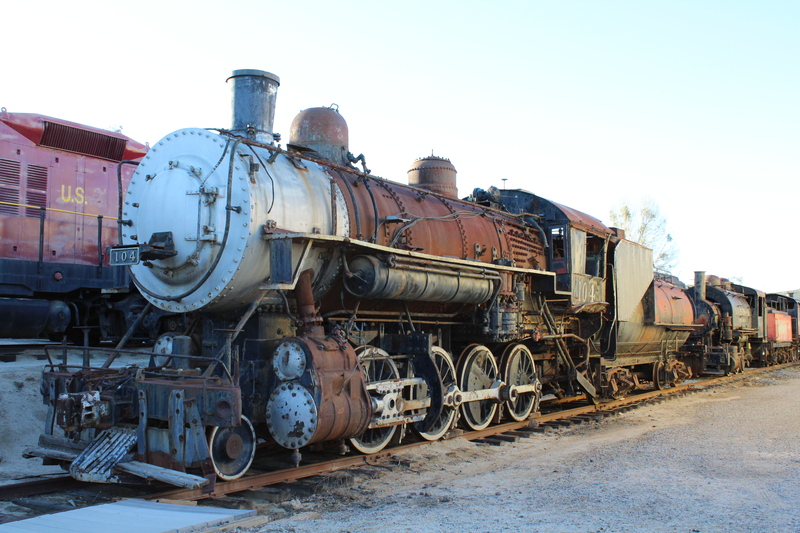 The equipment was moved by truck to a nearby Solana Beach siding on February 15, 1983, costing $10,000; moved free to San Ysidro by the Santa Fe and SD&AE; and taken to Campo in August 1983 on the museum’s “Great Freight”. Redesignated SDA #104, it received cosmetic restoration in 1992-95, pending full restoration.